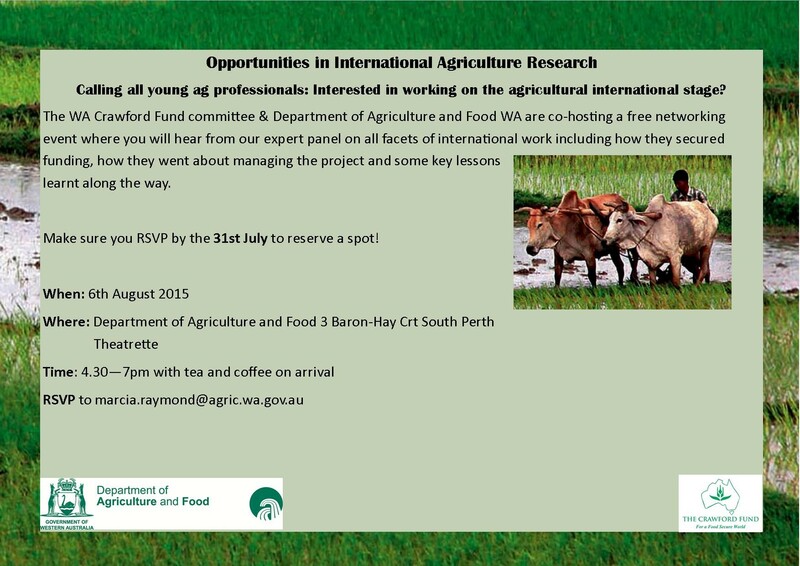 A free networking event for young agriculture professionals is being held in Perth next month. Co-hosted by the WA Crawford Fund committee and the state Department of Agriculture and Food (DAFWA), the event will cover opportunities in international agriculture research. The event will be held on 6 August from 4:30 pm at the Department of Agriculture and Food Theatrette. RSVP’s are required by 31 July to reserve a place. This networking event is just one of three organised by the WA Crawford Fund subcommittee for 2015. The events aim to connect and inform young researchers about opportunities for gaining experience in international development and food security, and to build awareness about the Crawford Fund. So far, in partnership with Scope Global, the WA young Crawford group has hosted a special event involving returned volunteers placed with Australian Volunteers for International Development (AVID), an Australian Government Initiative. Held in Perth on February 5, the volunteers shared personal experiences about their placements, as well as information about the agricultural research and international development projects in which they were involved. To supplement those events which consider volunteering and research opportunities, it is intended that the next activity will be to coordinate a joint event with Cooperative Bulk Handling Ltd (CBH Group) to consider the business side of international agricultural work. Information on future events will again be posted on our website and through our social media channels. To secure your spot at the August networking event, RSVP by 31 July to: marcia.raymond@agric.wa.gov.au.